English: Gray silky; French: Ptilogon cendrй German: Grauseidenschnдpper; Spanish: Capulinero Gris. 7.3–8.3 in (18.5–21 cm). 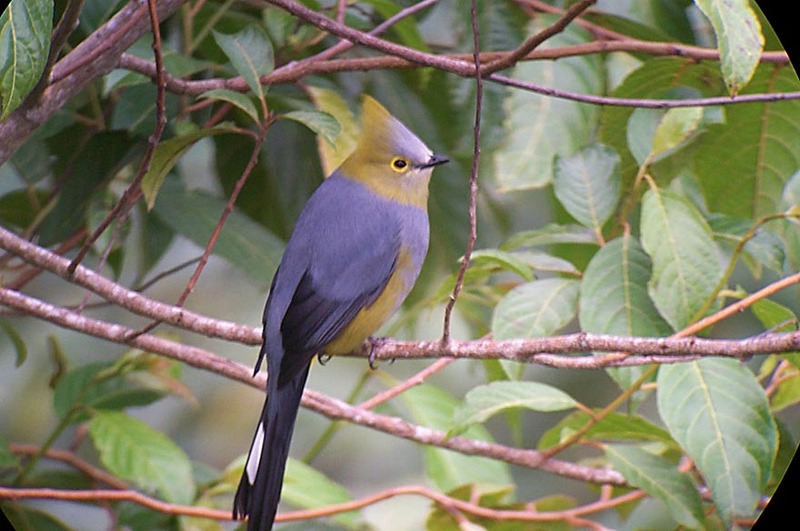 Sleek, long-tailed birds with crests and small bills. 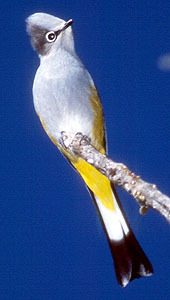 Male’s head, crest, and upperparts blue-gray, with white eye crescents and black wings. 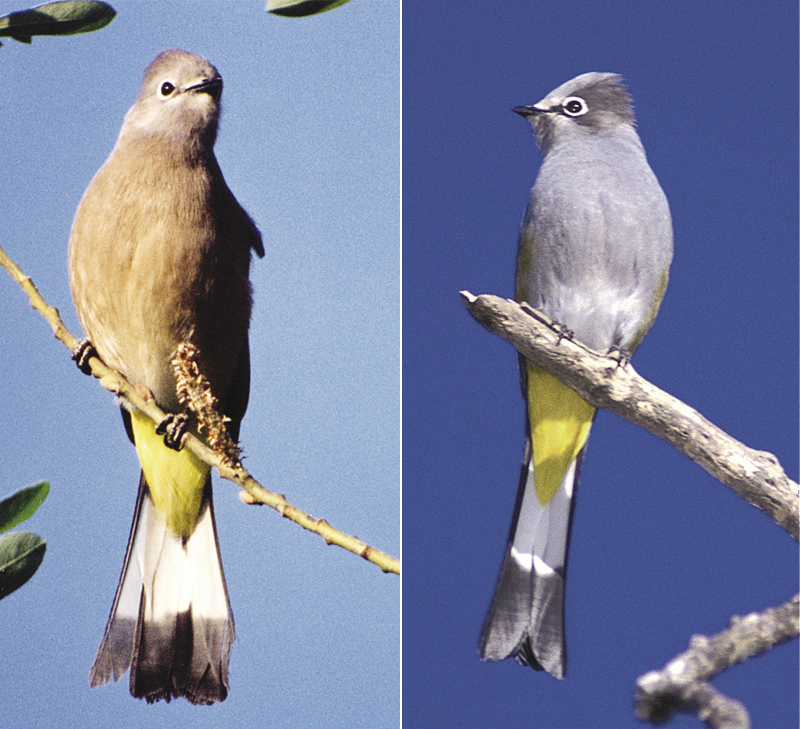 Belly white, black tail has bright yellow undertail with a white band. 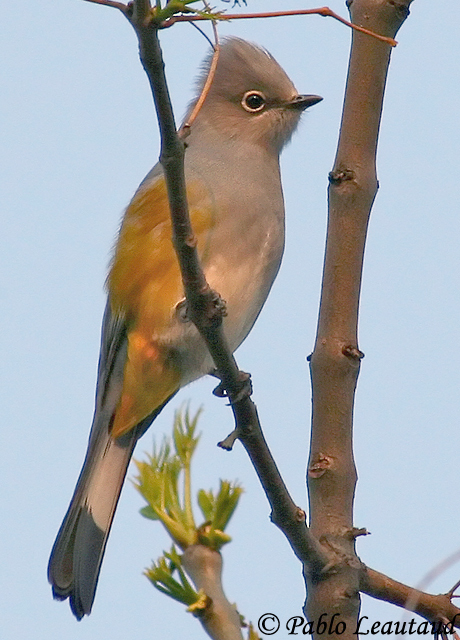 Female head and crest grayish, upperparts, throat, and underparts dusky wine-colored with yellow undertail. Whitish belly. 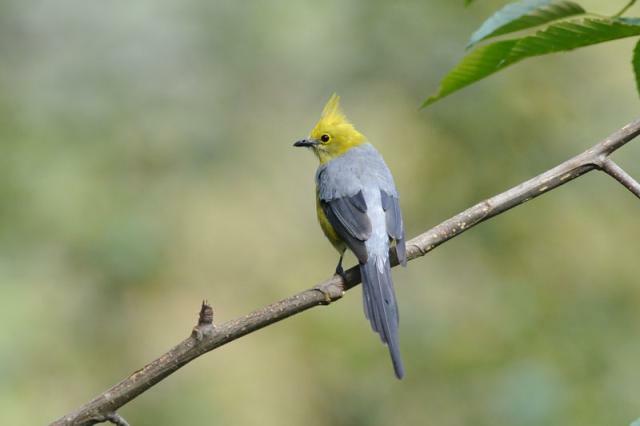 Juvenile resembles female, but belly dull yellow. Middle Americas. Throughout Mexico, south into Guatemala at 3,300–11,500 ft (1,000–3,500 m), lower in winter. Documented twice in Texas, sight records for southern Arizona. Also seen in southern California, though may be an escape. Diet mainly insects, often caught in flight, and fruits and berries. Monogamous. Lays two bluish white eggs, speckled and spotted with brown and gray, in cup-like nest of fine plant material and lichen; nests in bushes or trees. Female incubates for 12–14 days, young hatch naked and blind. Nestlings are fed by both parents and fledge in 18–20 days.